Prayer opens the way for the Word of God to run without let or hindrance, and creates the atmosphere which is favorable to the word accomplishing its purpose. Prayer puts wheels under God’s Word, and gives wings to the angel of the Lord “having the everlasting Gospel to preach unto them that dwell on the earth, and to every nation, and kindred, and tongue, and people.” Prayer greatly helps the Word of the Lord. Prayer invariably begets a love for the Word of God, and sets people to the reading of it. Similarly with the stony-ground hearers, and the thorny-ground hearers. Although the word lodges in their hearts and begins to sprout, yet all is lost, chiefly because there is no prayer or watchfulness or cultivation following. The good-ground hearers are profited by the sowing, simply because their minds have been prepared for the reception of the seed, and that, after hearing, they have cultivated the seed sown in their hearts, by the exercise of prayer. 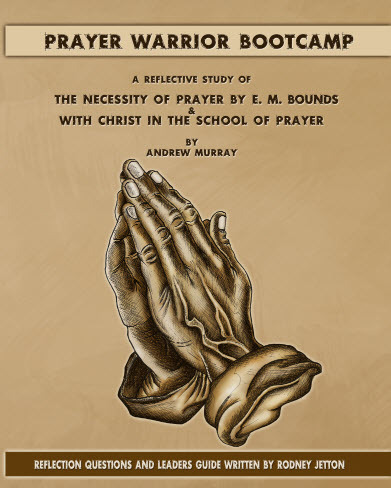 All this gives peculiar emphasis to the conclusion of this striking parable: “Take heed, therefore, how ye hear.” And in order that we may take heed how we hear, it is needful to give ourselves continually to prayer. Prayer invariably begets a love for the Word of God, and sets people to the reading of it. Prayer leads people to obey the Word of God, and puts into the heart which obeys a joy unspeakable. Praying people and Bible-reading people are the same sort of folk. The God of the Bible and the God of prayer are one. God speaks to man in the Bible; man speaks to God in prayer. One reads the Bible to discover God’s will; he prays in order that he may receive power to do that will. Bible-reading and praying are the distinguishing traits of those who strive to know and please God. And just as prayer begets a love for the Scriptures, and sets people to reading the Bible, so, also, does prayer cause men and women to visit the house of God, to hear the Scriptures expounded. Church-going is closely connected with the Bible, not so much because the Bible cautions us against “forsaking the assembling of ourselves together as the manner of some is,” but because in God’s house, God’s chosen minister declares His Word to dying men, explains the Scriptures, and enforces their teachings upon his hearers. And prayer germinates a resolve, in those who practice it, not to forsake the house of God. of those who strive to know and please God. Here the Psalmist found his protection against sinning. By having God’s Word hidden in his heart; in having his whole being thoroughly impregnated with that Word; in being brought completely under its benign and gracious influence, he was enabled to walk to and fro in the earth, safe from the attack of the Evil One, and fortified against a proneness to wander out of the way. Reading God’s Word regularly, and praying habitually in the secret place of the Most High puts one where he is absolutely safe from the attacks of the enemy of souls. Would we have a relish for God’s Word? Then let us give ourselves continually to prayer. He who would have a heart for the reading of the Bible must not — dare not — forget to pray. The man of whom it can be said, “His delight is in the law of the Lord,” is the man who can truly say, “I delight to visit the place of prayer.” No man loves the Bible, who does not love to pray. No man loves to pray, who does not delight in the law of the Lord. Here, let it be said, that no two things are more essential to a spirit-filled life than Bible-reading and secret prayer; no two things more helpful to growth in grace; to getting the largest joy out of a Christian life; toward establishing one in the ways of eternal peace. The neglect of these all-important duties, presages leanness of soul, loss of joy, absence of peace, dryness of spirit, decay in all that pertains to spiritual life. Neglecting these things paves the way for apostasy, and gives the Evil One an advantage such as he is not likely to ignore. Reading God’s Word regularly, and praying habitually in the secret place of the Most High puts one where he is absolutely safe from the attacks of the enemy of souls, and guarantees him salvation and final victory, through the overcoming power of the Lamb. Prayer leads to more _________________ ___________ ________________ and a stronger _____________________ for the Word of God. ____________ speaks to ___________ in the Bible; ____________ speaks to __________ in prayer. To purchase a copy of Prayer Warrior Bootcamp click here.